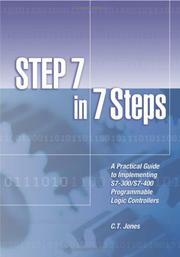 [LINK]: "Step 7 in 7 step"
The book is uniquely organized to include seven practical steps associated with getting the job done efficiently and painlessly. A task-oriented guide to configuring, programming, deploying, troubleshooting, and maintaining S7-300/S7-400 PLCs and Simatic Networks. Each of the seven task areas are introduced with a brief tutorial that is followed up with a number of actual task examples. No need add new "Thanks"
Re: [LINK]: "Step 7 in 7 step"
link is died. please re-upload.